Today, Skype launched a preview of their new software, Skype 5.0 beta for Windows, which supports group video calling for up to 5 people. 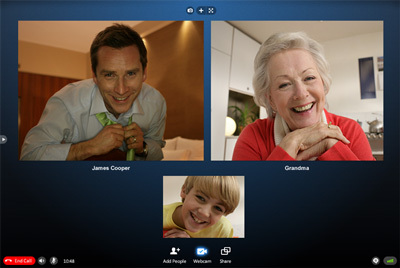 Group calling will be part of a new set of "premium" features that Skype will be rolling out in 2010. They haven't released prices for these new features yet but, for now, you can get the group calling for free as part of the Skype 5.0 preview. Group video calls are something I've been wishing for from Skype for years. Now I can get my kids on with their cousins in Philly, Chicago and L.A. all at the same time. Hopefully, the pricing won't be unreasonable or, better yet, Skype will change their minds and add it in for no cost. To make group video calls, the people you’re calling will also need to be running the new Skype 5.0 software, which can be downloaded here. Then, to start a group call just use the "Add" button to invite people into the conversation, and click the Video Call butto, as you would for any normal 2-way video call. The Skype 5.0 release is currently in ‘beta’, so Skype says there may be a few hiccups at the start. But, in my view, it will be worth dealing with a few bugs to have the video conferencing capabilities now. To get the best results, you will need a reasonably fast broadband connection, ideally one with at least 1 Mbps upload and download speeds (check your broadband speed) for HD video. And, for now, it's Windows only. Skype says a Mac version will be out later in the year. Today I have read many of your articles and must say you have the market covered. This will sure bring downs oovoo service. Keep up the great work and I look forward reading more interesting articles of interesting products in the very near future.